This article is about the Israeli Air Force base. For the international airport, see Ramon Airport. Ramon Airbase (Hebrew: בסיס חיל-האוויר רמון‎ (ICAO: LLRM), Basis Hayil-HaAvir Ramon, lit. 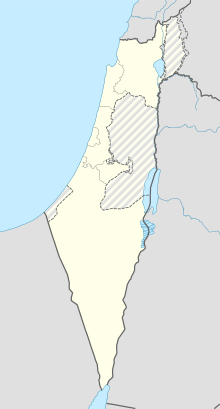 Ramon Air Force Base) is an Israeli Air Force base southwest of Beersheba, near the town of Mitzpe Ramon. Also titled Kanaf 25 (Hebrew: כנף 25‎, lit. Wing 25), it was formerly known as Matred. It was built as the result of joint Israeli and US government funding as part of the IAF's redeployment out of its bases in the Sinai after the peninsula was handed over to Egypt following the 1978 Camp David Accords. It was constructed between 1979 and 1982 by Air Base Constructors, a joint venture of Guy F. Atkinson Company, sponsor, (San Francisco); Dillingham Corporation (Honolulu); and Nello L. Teer Company (Durham, N.C.) in association with Tippetts-Abbett-McCarthy-Stratton (New York City). Its current commander is Col. Zvi Levi. ^ Gonn, Adam (2008-12-11). "Going East? The Israel Air Force and Iran". The Media Line. Archived from the original on 2011-04-12. Retrieved 2008-12-28. Wikimedia Commons has media related to Ramon IAF base. This page was last edited on 9 April 2018, at 21:36 (UTC).